Farmers, designers, artists, researchers, a communications specialist, a specialist in corporate governance and innovation, and a regional development manager worked together on the topic of diversity, from biological, agronomic and anthropological perspectives. 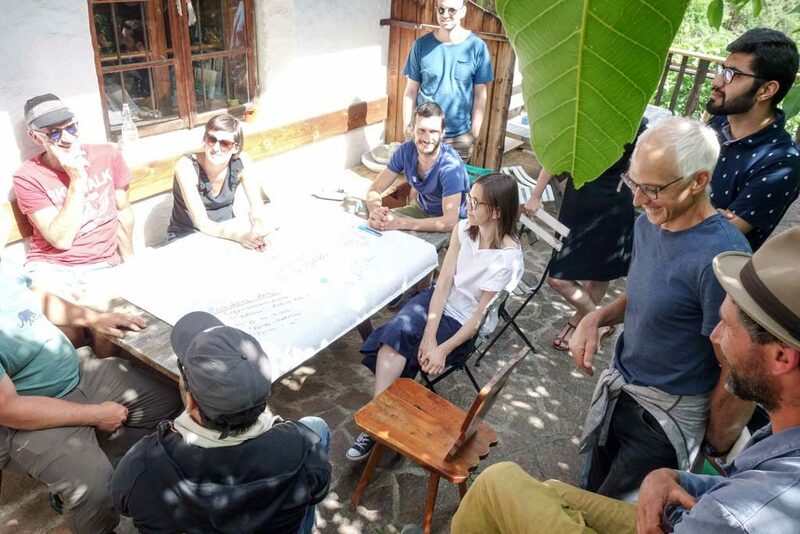 This participatory design workshop enabled the participants and facilitators to share their perspectives to generate a co-understanding of (bio-)diversity. The workshop was hosted at Aspmayrhof, Wangen-Vanga, courtesey of Margareth Kaserer and Simon Steinburger. 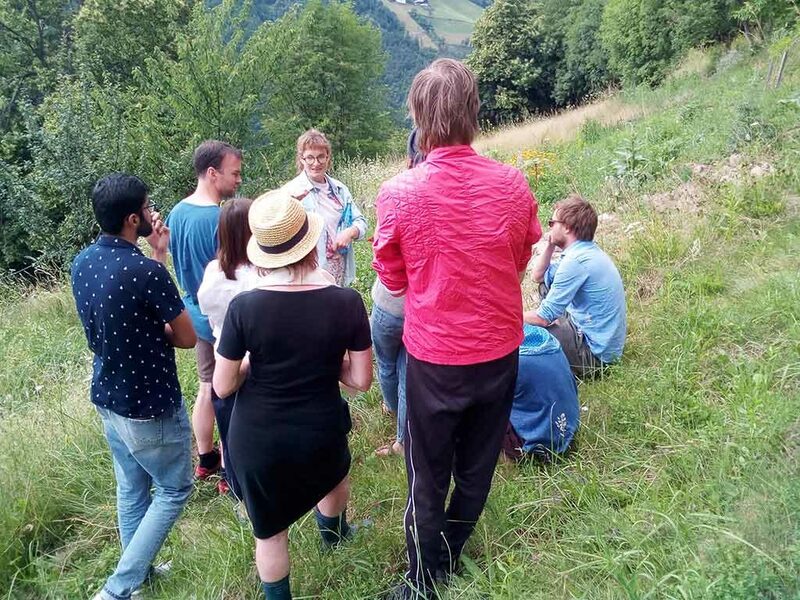 After an opening “speed-dating” session, where everyone got to know each other, Prof. Fuad-Luke, Faculty of Design & Art, Free University of Bozen-Bolzano raised questions about our understandings of (bio-)diversity and introduced a conceptual tool, The Diversity Triangle. 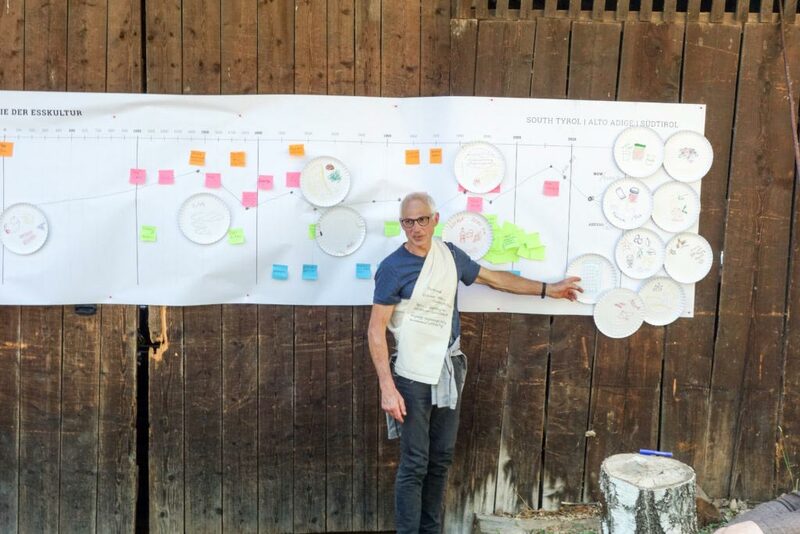 Participants were then asked to develop a “Food Timeline” for South Tyrol/Alto Adige/Süd Tirol, from Neolithic times to the present day, in order to better understand the factors influencing the production of food in the region. Assisted by the facilitator, they applied their own knowledge, discussed between themselves and referred to a small library of books made available as an aide memoire. They were focused on four key factors – historical events, food and culture food policy and laws and other factors – and asked to place post-its on the timeline. Participants were later asked to draw typical meals that represented different times on the timeline and to speculate on what the foods of the future on our plates would be. “Southern Latitude Food” – olives, oranges and lemons as the climate warms. After the Food Timeline, participants turned their attention to asking “What are the opportunities in (bio)diversity?” through group discussion, documenting the outcomes on a paper table cloth. Key insights were centered on the need to shift the present underlying paradigm and models. For instance: shift thinking from farm as food production centre to farm as an ecosystem and habitat; shift bureaucracy from heavyweight to lightweight but only for bio-farmers; shift values from a false sense of nostalgia to a “new nostalgia”; de-accelerate, “retro farming”, “retro food”. The workshop closed with the results of these discussions. Some of the participants were given a guided tour of the farm by the hosts, Margareth and Simon, who explained how they worked the land, their philosophies and how they combined their ideas of farming with other practices on the farm centered on art, performance and music. These participatory workshops are framed as a collective learning process. What Could A Farm Be? and muu-baa wants to make the most of each participant’s knowledge and potential, so we are continually reflecting on the methods and the languages applied and generated in the participatory processes. The ultimate aim of these workshops and, indeed these explorations is to encourage others to explore.